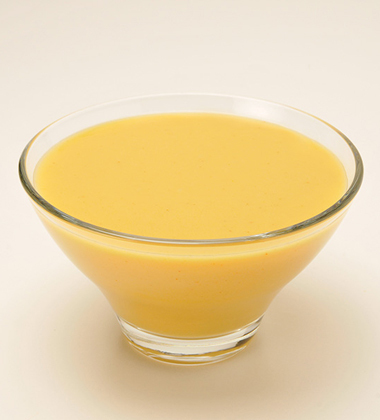 INGREDIENTS: WATER, COCONUT, CREAM, SUGAR, CANOLA OIL, MODIFIED CORNSTARCH, SALT, CARROT JUICE CONCENTRATE, CARROTS, LEMONGRASS EXTRACT, LIMEJUICE CONCENTRATE, GARLIC POWDER, SPICE EXTRACTS, MODIFIED MILKINGREDIENTS, YEAST EXTRACT, POTATO FLOUR, ONIONS, CELERY, DEHYDRATEDCARROTS, XANTHAN GUM, SEASONING (SOY), FLAVOUR. Easy to prepare: Thaw pouch 24 hours prior to heating, dilute 1 part water to 1 part soup base, pour base into rethermalizer and heat to 85°C (185°F). Product is produced Ready To Eat. The soup base's high flavor intensity is designed to provide a complete soup flavor profile once garnish is added in. Heating Instructions: Dilute 1 part water to 1 part soup base. Heat until warmed through, approximately 85°C (185°F) and hold for serving. Stir often. POUCHES / KEEP FROZEN / DO NOT USE IF POUCH IS PUNCTURED OR TORN.